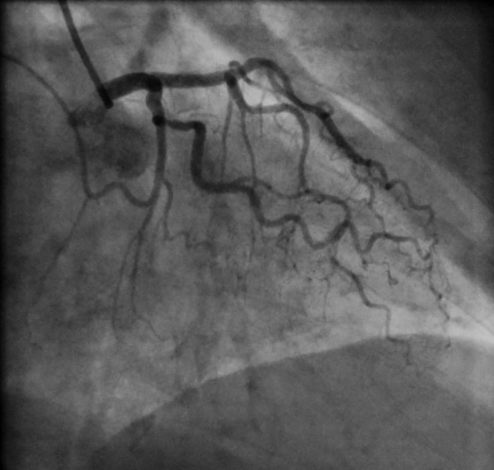 Angiography is a test that uses an injection of contrast (X-ray ‘dye’) to visualise the coronary arteries of the heart using X-rays. The test shows if the arteries have narrowed and helps decide what management the patient requires in the future. How is Angiography carried out? An arterial sheath needs to be inserted into either the femoral artery (groin) or the radial artery (wrist). To do this, local anaesthetic is injected at the access point. Access to the artery is gained using an introducer needle and a soft tipped wire is then fed into the artery via the needle. The wire remains in place and the needle is removed. A soft plastic tube (introducer) is then fed over the wire into the artery and the wire is then removed. Catheters can then be passed through the introducer around to the patient’s heart, allowing contrast to be injected directly into the coronary arteries under X-ray guidance. The images are viewed on a monitor. Referral for Cardiac Angiography is made by a consultant cardiologist.